What other coolness are you looking forward to at the Christmas Party? Mimo i got an idea! Maybe dilivering presents will be part of the mission and the mission will be out Friday? Like the Club Penguin Elite Force Christmas mission which you can do on christmas? I can't wait! Mimo! Probably the sleigh ride/delivering presents, might be a mini-game. Sorry Lil man 2k9 but it said it said that the missions out on the 24th. Exactly what i was thinking! Are we related somehow? He. Game for members to deliver to non mebers and members, anyone whos on Santas good list lol! How do I get pictures up on my blog? I was just wondering cause I need to put loads up! You may be right! That's brilliant! Yah! I agree! It's for the magic sleigh ride! hmmmmmmmmmmm i can not wait for the xmas party! Mimo i just found out what is in the present its a chair i think its santas chair LOL! also i think the sleigh ride could be a new game only for Christmas! U know wat i hate, ppl saying that rockhopper is somewhere when hes not! Like ppl will be saying hes in the migrator then evreyone will want to go there. Then cuz the treasure hunt is the eassiest way 4 me to get coins i cant get in! Dont they know rockhopper cant come in a full server or room? do anybody know where rockhopper is? Hey guys (and gals) I'm back! School's kinda gotten In the way, so I haven't been on here recently. Kool, we can deliver presents? TOTALLY EPIC! We're like elves! Oh, I snooped around, and I found one of my Christmas presents! SHH!!!!! I'm getting the ninja and knight mix n match pack! WOOT! Hey, why do I keep putting ! 's on my sentences? LOLZ. COol! I cant wait! i have a membership so i cant wait to do the sleagh! Dude, reminder, only put CPG mod after ur name when you r modding. J J, (can I call u J J???) if you mean the PSA mission, it's out on the 29th. Sorry! Yeah i doubt it will be a mission. You only puy CPG MOD aat the end of your name when you are modding. You can find out more on the mod page. Can't wait! The sleigh ride sounds fun. Hey Mimo! Cool post! Well I should start Moderating right now! Yeah, I totally hate that. But if they say he's on Ice Berg server, and they're on Mammoth where you are, I always point out that they don't have a background, and they are either trying to get in to meet him or just staying on Mammoth when they COULD be on Ice Berg dancing with RH and Yarr! Don't you always notice that...? Ooo since you said that I agree with you! That could be cool! That might be part of the mission! I agree too dude! I think it's for the Magic Sleigh Ride! The post below this one, you can see Mimo's awesome Famous Penguin Tracker! Hee, hee! love the theory. No, but remember to often check Mimo's Rockhopper Tracker, it'll help you. It isnt the one below. It is really the one 2 below this one. The one below is about a new mission that will hopefully come! Just helping! Great thought! One problem though. The sleigh ride is through certian days! So it cant be a multiplayer games. Hope this helps! Check the comment RH tracker. MUST READ, CP ON ABC 7 NEWS! There was a news report on ABC news and they said that Club Penguin is one of the safest games. It is on the safe games list on ABC News channel. Mimo,maybe the delievering presents and the sleigh ride will be a game which u can earn money and maybe it will give u something special! :D that will be cool! That'd be awesome! And cool... and awesome! Wait... did I just say that? First, press Alt and Prt Scrn (Print Screen located above the Insert button which is somewhere above your number keys next to the place with letter keys) then minimize your window and open up your Start button. Go to Programs, then Accessories, then Paint. When the Paint window opens, go to file, then go to paste. You can edit your pix from there! Good luck! Well, Rockhopper usually only can stay for about five minutes. People crowd all around him and stuff, and when he leaves they linger for a while. You may have come when he left just then. That happens to me a lot; it's annoying, but it's not because people lie about it. I've never known someone to lie about Rockhopper's location! What annoys me is this: When people leave a whole bunch of comments telling about random things having nothing to do with where Rockhopper is. P.S. Hey Mo, when are you gonna have more mod promotions? Maybe members will deliver presents to non-members... would be cool! Wow,I can hardly wait for the Christmas Party.It's my favourite time of the year. I can't wait till the Christmas party. This year it sounds better to the other years. I'm entering for the igloo contest but i know i won't win, it's just for fun. Oh i hope it is, it sounds like fun. Maybe it will be like the hot air balloon ride but you go around peoples igloos which are on the map. I think that it is part of the sleigh ride and like you fly about in it (like the hot air balloon) and hand out presents to open members igloos and if they have a christmas tree, it will be sitting underneath it and i think you should be able to open it on christmas eve or christmas day. HHmmmmm.... If you look on the top of the lighthouse in the town, you see construction... Maybe there will be the slay ride up there! Oh,and maybe Rockhopper will be dressed up like santa, driving the slay. Lol... I kinda hope not because it would probably be a new mod bg. . .
Mimo did you know if you dress up as the christmas tree costume and you wave you get lights on your costume. I think its kinda cool. Or delivering presents can be a new game for members only heh? Where is the new fire dojo room in the hq screen? Is it going to show it on the blank box, or will they keep it off for all of the non-members? hey maybe itll be a minigame and we get a present in return for playing! I think the sliegh ride will be like the like the hot air balloon from the festival of flights. I might be wrong but Santa could be coming and and it could be his big sled! 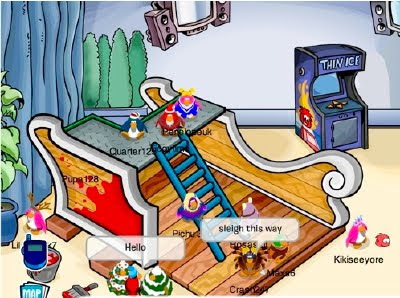 Hey Penguins, I was thinking maybe this sled thing is a new Game for Christmas,Ya know to earn coins! It depends which blog hoster your using cause there a lot. If you mean the pics mimo used you cant unless you get them from another place cause it's copyright. Sorry i couldn't help much but i will if you tell me which blog your using. I want to pics up like from the catolog but i'm not sure how, if you can help me great! Good luck trying to find him! sorry for not posting for a bit but the time differences, it's hard to try and answer questions cause it's night when you put something new on! I know it's not your folt but you know i'm probably the only one who lives in England!! JJ is my teddybears name. SO, no. Call me slick! Sorry. P.S. Mimo, that actually counts as an answer! It was me! Sorry for not putting up my name!